Hathcock Home Services is one of the oldest and most experienced awning companies in the Tri-state area. We offer a wide variety of awning types (both commercial and residential) to best suit your needs and taste. When you it comes to our awnings, we go the extra mile to assure the best possible results. 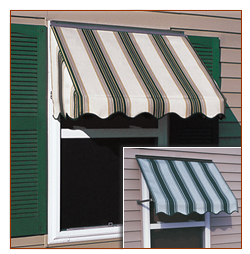 When you combine the highest quality material with top-notch craftsmanship, you get an awning that's built to last. Whether you're looking for an awning to protect your vehicles or a place to hold family gatherings, Hathcock Home services has got you covered! 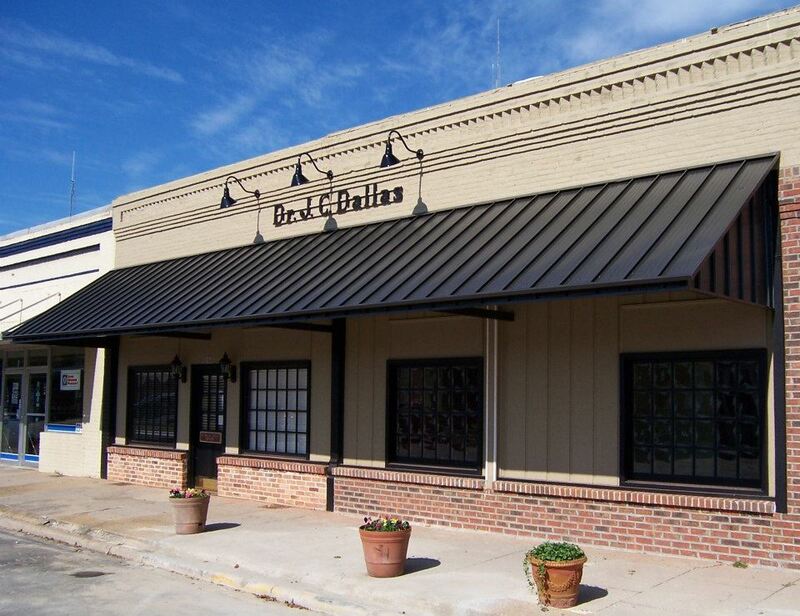 Commercial Awnings - Protect your customers and improve the curb-appeal of your business with an attractive awning from Hathcock Home Services! We also construct awnings to cover your loading docks and bays for commercial warehouses. Superbly engineered and well built covers ensure an awning that lasts! Choose between numerous style, colors, and options to fully customize our awnings to fit your needs, taste, and budget. 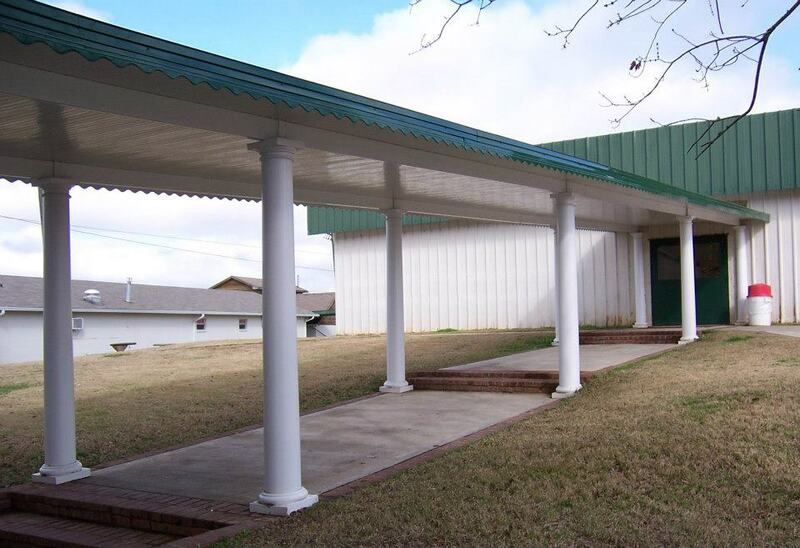 Please view examples of our store-front awnings in our photo gallery. We offer superior customer service and an open line of communication on all projects. To learn more about our awnings, please contact us. 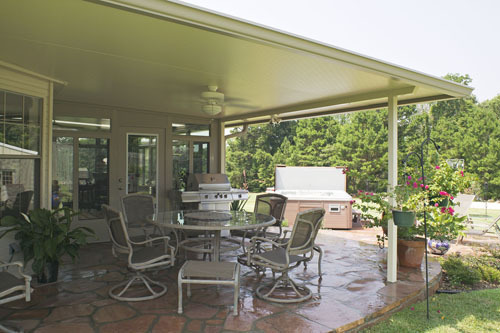 Patio Covers - Make the most of your patio and deck with an awning from Hathcock Home Services. 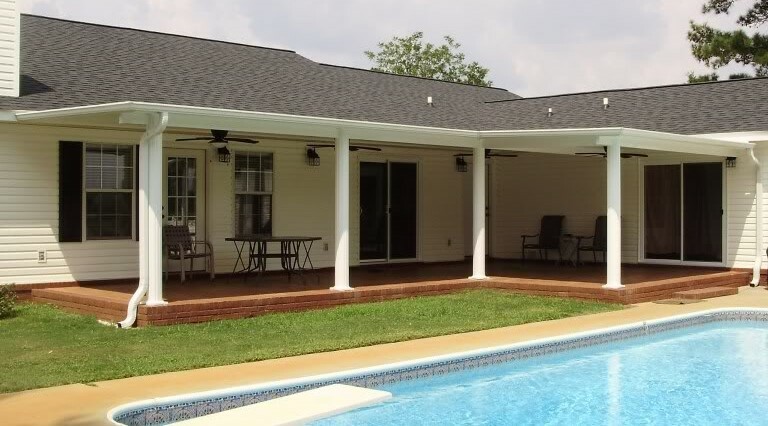 Our covers provides elegant protection from the blazing sun and soaking rains so you can enjoy your patio and deck when others are driven inside. Choose between numerous style, colors, and options to fully customize our awnings to fit your needs, taste, and budget. Insulated covers are also available for increased comfort. 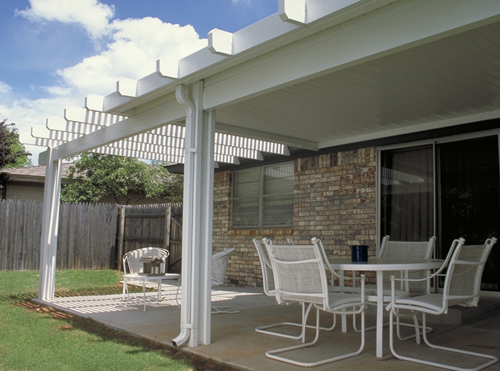 Please view examples of our patio covers in our photo gallery. We offer superior customer service and an open line of communication on all projects. To learn more about our awnings, please contact us. Carports - Make the most of driveway with an awning from Hathcock Home Services. Our covers provides your vehicles with elegant protection from the blazing sun and soaking rains. Choose between numerous style, colors, and options to fully customize our awnings to fit your needs, taste, and budget. Insulated covers are also available. 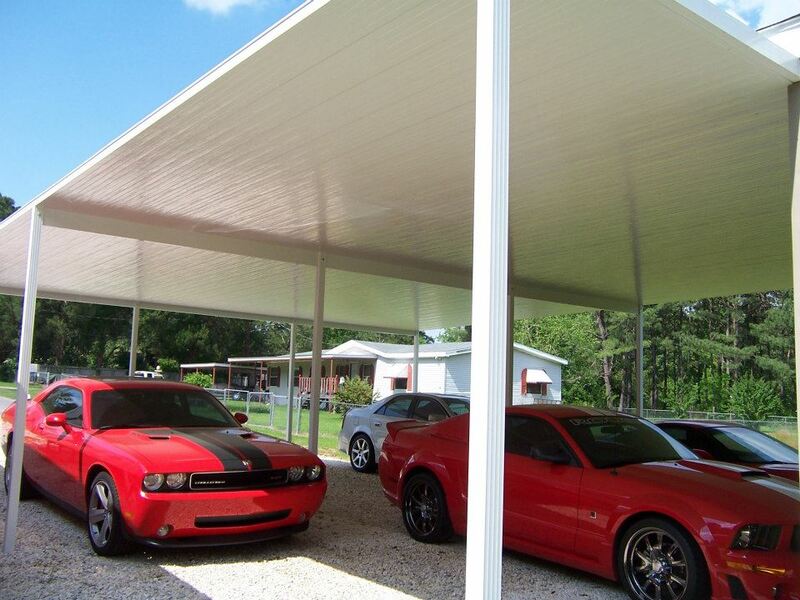 Please view examples of our carports in our photo gallery. We offer superior customer service and an open line of communication on all projects. To learn more about our awnings, please contact us. Walkway Covers - Blending form with function, our aluminum walkway covers provide aesthetically pleasing shelter to students and pedestrians at many of the area's schools, churches, and other public facilities. We design and fabricate all of our covers guarantee the highest level of satisfaction for our customers. Choose between numerous style, colors, and options to fully customize our awnings to fit your needs, taste, and budget. Please view examples of our walkway covers in our photo gallery. We offer superior customer service and an open line of communication on all projects. To learn more about our awnings, please contact us. Door & Window Hoods - Our window and door canopies are available in several styles to fit nearly every application. We offer a large array colors and patterns, in both aluminum and fabric, allowing you to find the ideal awning to compliment your style. Please view examples of our awnings in our photo gallery. We offer superior customer service and an open line of communication on all projects. To learn more about our awnings, please contact us. Insulated Panels - Our insulated LRP (Laminated Roof Panel) are made with an expanded polystyrene (EPS) foam core. EPS is a high-performance insulation specified by architects nationwide for many of today’s energy efficient homes. Using these insulated panels with our patio components will create a strong, durable patio Cover or carport. Our insulated LRP roof panels begin with baked enamel finish on aluminum skins. These aluminum skins are permanently pressure bonded to a 3” core of EPS (Expanded PolyStyrene Foam). 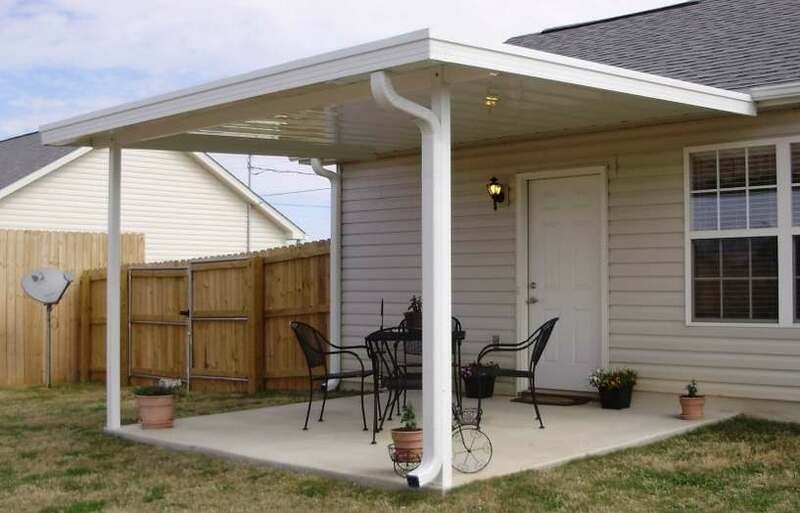 Roll-Form Panels - Patio Cover/carports provide economical, solid shade that protects you and your home from inclement weather and harmful UV rays while also providing shade for relaxing. Most covers built today are formed from roll-formed 3" riser panels - similar in design to standing-seam metal roofing. The result is an attractive and afforable cover that is maintenance-free and long-lasting. Lattice Wraps - Combine our insulated panels with embossed aluminum rafters to give enhanced dimension and style to your new Patio Cover. 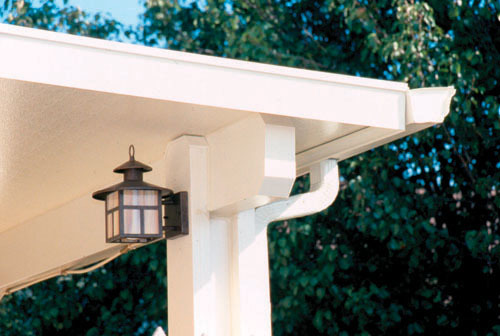 Beautiful and maintenance-free, these awnings will impress all for years to come! 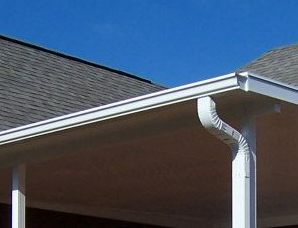 Gutter Systems - Seamless gutters and downspouts are options on all of our covers and awnings. This allows rainfall to be channeled away from your home's foundation. Leaf-guard is also available. Hathcock Home Services can assist you by installing aluminum awnings, patio and walkway covers, walkway and window awnings, and door awnings. Our company serves customers in Dothan, Ozark, Enterprise, and the surrounding southeast Alabama region. We also serve customers in parts of southwest Georgia and the northern Florida.